Released in late 2006, the Intel Xeon quad-core 5300 series CPUs (code named Clovertown) are 64-bit server/workstation processors utilizing four Intel Core microarchitecture cores. These processors are based on Intel’s 65 nanometer process technology combining high performance with the power efficiencies of low-power Intel Core microarchitecture cores. 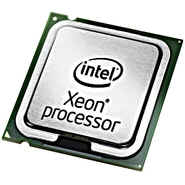 The Intel Xeon 5300 series quad-core processors consist of two die, each containing two processor cores. The Intel Xeon quad-core 5300 processor series integrates virtualization hardware support with Intel Virtualization Technology, which enables more effi- cient virtualization solutions and greater capabilities including 64-bit guest operating system support.